My garden this year has been a *huge* learning experience. A few to many set backs and lots of frustrations. So with that being said, I’ve noticed my blog has temporarily turned more into a cooking blog, which I don’t necessarily mind, I enjoy cooking! But my main reason for this blog is to document my gardening experiences, good or bad. So this week I will write a post doing just that and briefly talk about my plans for our fall garden. P.S we have about 14 weeks (give or take) until our first frost, if you are planting a garden this fall, start planning! SO…a vegan PASTA dish. No butter. No cream. No cheese..unless you want it in there, in that case I won’t tell anyone ;). Heat oil in a large (read: 12 inch) skillet over medium heat. Once the oil is shimmering, add the sage and toss to coat. Let the sage get crispy before transferring it to a small bowl. Sprinkle it lightly with sea salt and set the bowl aside. Add squash, onion, garlic and red pepper flakes to skillet. Season with salt and pepper. Cook, stirring occasionally, until onion is translucent, about 8 to 10 minutes. Add broth. Bring the mixture to a boil, then reduce heat and simmer until squash is soft and liquid is reduced by half, about 15 to 20 minutes. In the meantime, bring a large pot of salted water to a boil and cook the pasta according to package directions, stirring occasionally, until al dente. Drain, reserving 1 cup cooking liquid. Once the squash mixture is done cooking, remove it from heat and let it cool slightly. Transfer the contents of the pan to a blender. Reserve the skillet. Purée the mixture until smooth (beware of hot steam escaping from the top of the blender), then season with salt and pepper to taste. Combine pasta, squash purée and ¼ cup cooking liquid in reserved skillet and cook over medium heat, tossing and adding more pasta cooking liquid as needed, until sauce coats pasta, about 2 minutes. Season with salt and pepper if necessary. Serve pasta topped with fried sage, more black pepper and shaved Parmesan/Pecorino and/or smoked salt, if desired. 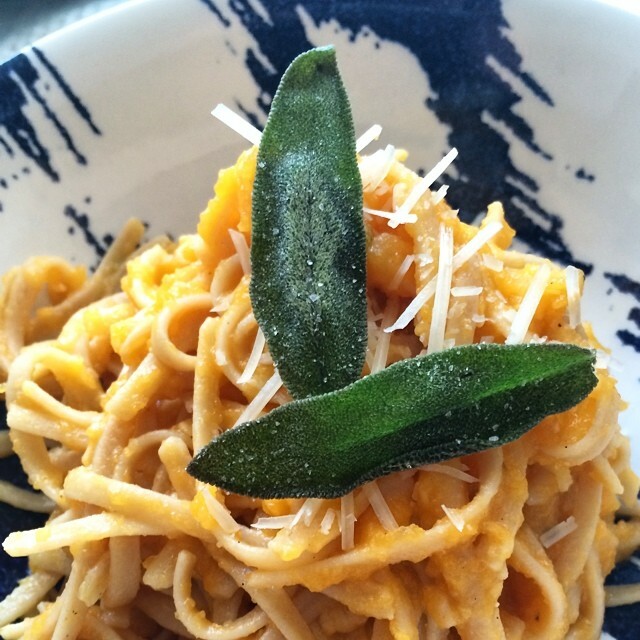 Adapted from Bon Appetit’s Winter Squash Carbonara with Pancetta and Sage (February 2014). Recipe yields 4 large servings. The squash purée is a killer bisque, which you could thin with vegetable broth if you’d like. You could also stir it into risotto at the end of cooking. Make it vegan: skip the cheese garnish. Make it gluten-free: use gluten-free pasta. Commenter Jenn recommends corn and quinoa blended gluten-free pasta, which is firmer than brown rice pasta.